Margaret Rizza has composed this sumptuous setting for congre­gation and organ with optional choir and instrumental parts. As is always the way with her music, Broken for You is full of lovely, sing­able melodies, perfectly reflecting the mood of the texts. Broken for You is published in two versions: the first for use with the new Common Worship texts of the Anglican Church, the second for use in the Roman Catholic rite. There are SATB and Unison versions for each denomination. A FREE CD is included and a licence is available to photo­­copy the congregation's part. Broken for You: Anglican Unison Edition by Margaret Rizza was published by Kevin Mayhew in May 2003 and is our 9880th best seller. The ISBN for Broken for You: Anglican Unison Edition is 9781844170630. Be the first to review Broken for You: Anglican Unison Edition! Got a question? No problem! 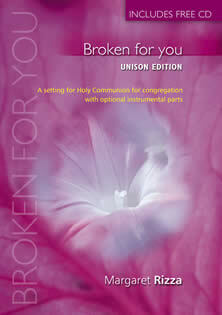 Just click here to ask us about Broken for You: Anglican Unison Edition.